Lately I’ve been curious about the Bible. To be honest, I’ve never read it. I mean I’ve read the first few pages about God creating the moon and stars, but that’s as far as I got. 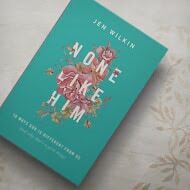 So when I got the opportunity to read None Like Him: 10 Ways God is Different From Us by Jen Wilkin, I was curious to know more. Verses for Meditation is just that, verses from the Bible that goes along with that chapter. Questions for Reflection are again just that, questions that make you think about what you think and how you felt about that chapter. As an example, from the chapter Omniscient, one of the questions ask “What kind of knowledge do you crave the most? How can you discern whether your hunger for it is healthy or unhealthy?” And Pray gives you a starting point of what to pray about pertaining to the chapter. So I would probably read one chapter a day and then that would give you time to reflect and really think about the questions. Then you have that whole day to think about the Pray starting point. The book is basically in my opinion mostly about how God knows everything about us, but we will never truly know everything about him, there’s just too much! 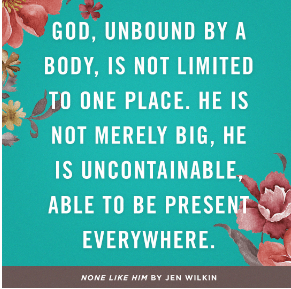 He is everything, He is infinite, there’s no end to his love and devotion. None Like Him is also about how God forgives everything we do, but we as humans are always judging each other, we are always sizing people up. It also talks about how we sometimes put everything before God, but God should always come first.